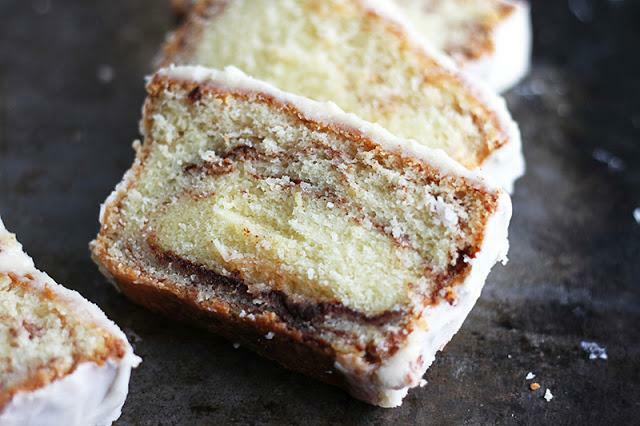 Cinnamon Roll Pound Cake Recipe! In a small bowl mix ¼ cup sugar and cinnamon. Pour ⅓ of batter into loaf pans. Sprinkle half of cinnamon sugar mixure into pan. Repeat with remaining batter, then cinnamon sugar, then ending with batter. *different climates and altitudes can affect the baking time of this cake, which is why the time to cook is suggested as 50-80 minutes.